Make the dressing: Whisk all the dressing ingredients together and set aside. Prep the vegetables: Wash and spin-dry the escarole leaves; tear them into bite-sized pieces. Trim the root end of the fennel bulb, cutting where the stalk meets the bulb. Discard any bruised or brown layers of bulb and thinly slice the bulb lengthwise. Peel away any bruised or brown layers (the top one or two layers) of the Belgian endive and slice lengthwise into ½-inch rounds. Prep the fruit: Place the apple on a cutting board, stem side up, and cut ½-inch slices until you reach the core. Repeat around the apple, ending up with a square core. Discard the core. Stack the apple slices and cut into ¼-inch matchsticks. 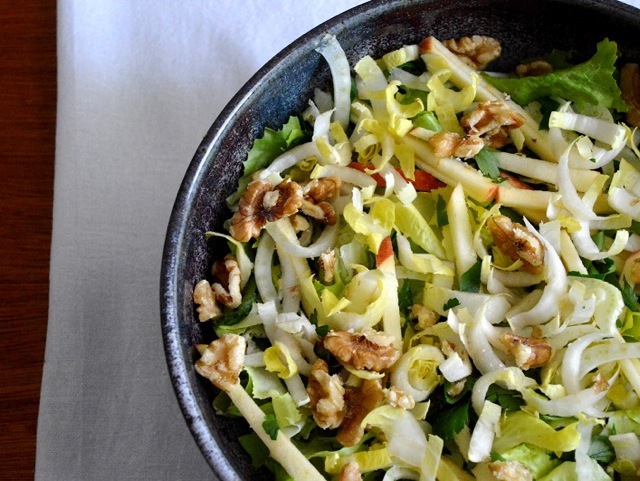 Assemble the salad: In a large bowl, place the escarole, fennel, endive, apples, walnuts, parsley, and bacon, if using. Toss everything together with three-quarters of the dressing. Taste for salt and pepper, adjusting as necessary. Add additional dressing if needed.